Unfortunately, this bus line between Boston and Brattleboro VT via Worcester, Fitchburg, Gardner, Greenfield, Orange, is now out of business. 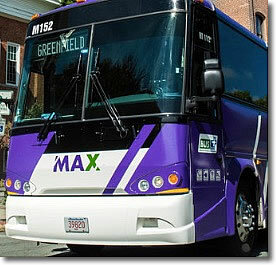 Founded in 2016 and out of business in 2017, MAX (for Massachusetts Area Express) operated a daily bus between Boston's South Station Bus Terminal and Brattleboro VT, stopping at Worcester, Framingham, Leominster, Fitchburg, Gardner, Athol, Orange, Erving, Greenfield and Bernardston MA. The line required public subsidy, and was unable to acquire it.